When you are shopping for a blender, sometimes, we pick aesthetics. There is nothing wrong with that. But if you want to end up with the fastest blender, what you want to look for is the wattage rating. The higher this is, the higher RPM you get (revolutions per minute). The faster your blender can rotate, the easier it is to pulverize, liquefy, and mix anything you want. Don’t be surprised that the higher the motor wattage gets, your blender becomes more expensive. But here’s the thing, I ended up with an expensive blender myself because I can save time with it. Nowadays, many people replace their breakfast with protein shakes and detox tea as a way of losing body fat. 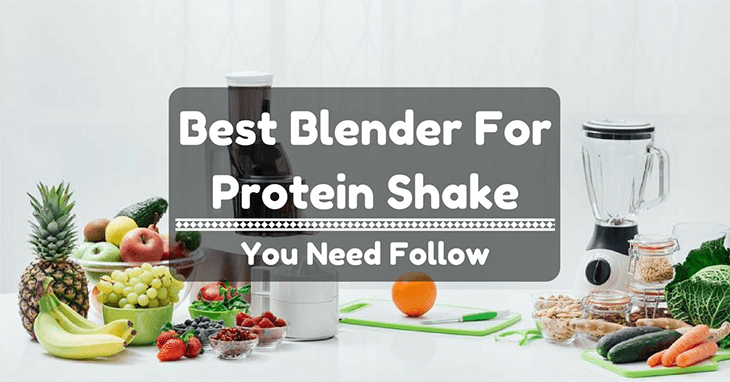 If my blender has a big motor, then I could make a protein shake in just seconds! If you have a tight schedule, it can help you save time! How many servings do you need in a batch? A bigger pitcher means you can make a huge batch in one go. The great thing about consumer-based innovation is that pitcher now doubles as your tumbler! This inevitably cuts more time preparing and less stuff to wash after! Isn’t that nice? With a big motor and a serving tumbler, you can even make your shake last minute! Yep, even just before you leave! Because of our advancement in technology, everything that used to be large is now miniaturized! 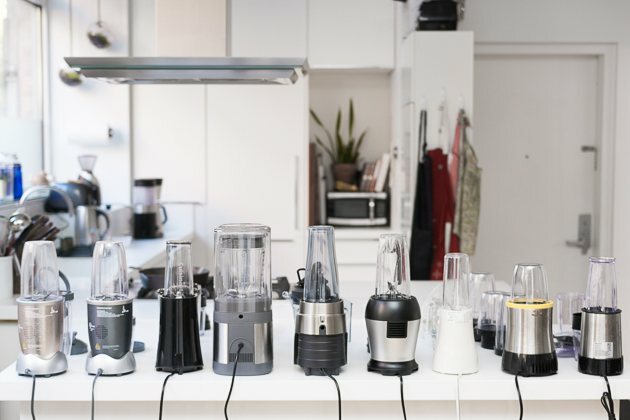 Like the other drink makers such as juicer, tea maker...blenders used to take a lot of space on the kitchen counter, but now, you can choose from models that have a compact and powerful motor. Gone are the days of huge appliances! Aside from the relevant decrease size, blenders now have simpler controls. Some feature a single button control; some others just have two or three settings. With this basic design, you can never go wrong regarding operation! The glass is probably the easiest material to clean up. It is resistant to wear and tear and can last a lifetime (unless someone drops it!). You can stick glass in the dishwasher, and you’re done. Some plastic material may not be safe in the dishwasher and may promote wear. Another material you may want to consider is polycarbonate. It’s as clear as glass but lighter in weight. It’s also break resistant and dropping it from time to time won’t hurt the material that much. The only upside of glass is it won’t get stained even when you abuse it! Aside from making protein shakes, and smoothie from fruit and vegetable like apple, water lemon, cabbage...I know, you have a lot more stuff you want to do in your kitchen. Maybe you also want to grind dry ingredients like flax seeds, or oats, or some coffee beans. Some blenders feature interchangeable blades and can serve this purpose. Well, you may not be able to grind large batches at a time, but you do get a mini food processor! You may not be thinking about this right now. This is an issue about the future. But, when you have a loose gasket, it’s good to know that you can easily order a replacement part. A long warranty is not just a consumer protection. It also says something about the manufacturer. If manufacturers are willing to give long warranties, it means that they are confident with their product that it will last! Cuisinart, a 47-year-old company, has been manufacturing kitchen equipment since its establishment. They pioneered the invention of the food processor and had claimed expertise in the field of motorized kitchen equipment. This blender has a 350-watt rating and can swiftly make you a protein shake in a few seconds. With the other attachment it has, you can pulverize some flax or oats to mix with your protein smoothie. The sleek stainless design and black body make it a pleasing sight in the kitchen! It has four simple controls. High, low, high pulse and low pulse. It comes with one 32oz pitcher, four 16oz jugs, one 8 ounce jar, one blender blade, and one chopper blade. It also comes with individual cup lids! You know what this means right? You can take your protein shake or smoothie with you right after making it! You also get a chopper you could use to pulverize seeds, coffee, and other stuff. 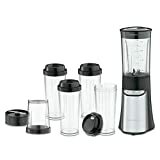 15 Piece Set - Cuisinart gives you a 32oz pitcher to make a shake or smoothie for two people. You also get four jars with covers. You can make smoothies in advance and place them in the fridge! You get a chopper too! What else would you need? Three-year warranty - Cuisinart is confident that their product will serve you for at least three years! 350-watt motor - The three hundred watt motor can easily make you a perfect shake or smoothie in less than a minute! Without any load, the motor can send the blade spinning in as fast as 15,000RPM! Saves you space - The slim design of the CBP-300 takes up very little space in your kitchen! This means you don’t have to box and stow them after every use! Dishwasher safe - After having your protein shake, cleaning up may take longer time than making a protein shake! But, they are dishwasher safe! Just leave it and let the dishwasher do its job. Has no locking mechanism - With a blade spinning near 15,000 RPM, It’s a little scary to see the jug wobbling as the shake is being ground. There is no locking mechanism for the pitcher or jar to be held steadily in place. The cup base is a little small - There’s nothing wrong with it as it can make great smoothies and shakes. But if you have kids at home, you may find out that it can be easily knocked over. You may not know about Sunbeam Company that much, but it is what’s behind this awesome piece of the 250-watt blender. Oster pioneered and popularized the usage of the blender. 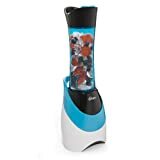 Oster My Blend is a personal blender meant to make a single serving at a time. The to-go tumbler doubles as your blender canister and comes with a spill-proof lid. They are available in many different colors so you can express your personality with it! Probably, Oster had fitness people in mind when they designed this as they call their jug a sports bottle. Color selection - You can choose a color to match your other kitchen stuff. 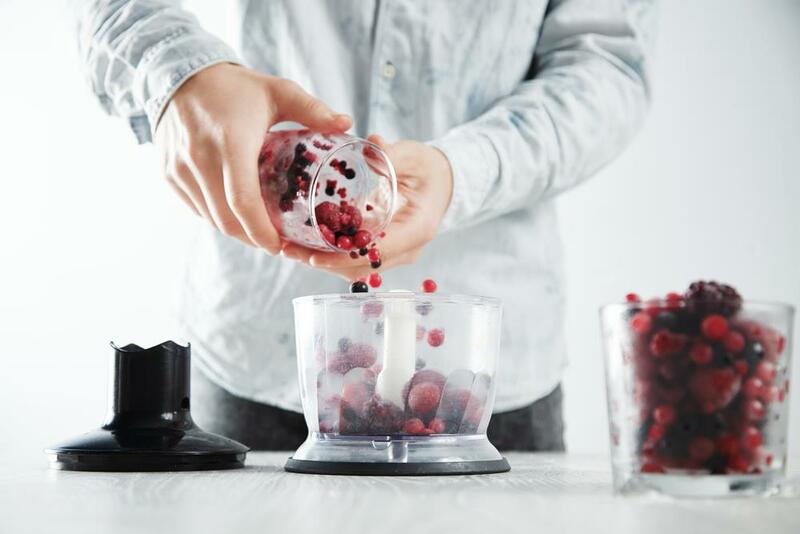 Slim design - The slim design of this blender takes very little space in your kitchen. Simple operation - There are two modes of operation. Pressing the tumbler down will power the blender for pulses. Twisting it on clockwise locks it in the continuous blending mode and you can leave it a couple of minutes until it’s done. 250-watt motor - With a 250-watt motor, you can generate about 10,000 RPM. That’s a decent speed, and you will not have trouble with your protein shake. But should you decide to make some smoothie, you may not get the finest consistency. No alternative function - If you are not planning on using it for other stuff, you won’t have a problem with this. But, if you are looking forward to crushing some flax or oats and adding it up to your protein shake, you may need a different kitchen equipment for that job. This amateur company is gaining a bit of popularity in the kitchen equipment industry. This personal sized blender can blow you away! The price is insanely low, and you can easily grab it! The design is quite similar to the Cuisinart’s black and stainless-steel design. This blender comes with two 16oz cups and one 8oz cup. It also has two comfort lip lids and two to-go lids if you are always on the go. You also get two blades. One blade for your shakes and smoothie and one blade for chopping. If you want to grind some fresh herbs, you can grind it with this and put on the shaker lid when you’re done, and you can sprinkle some on your recipe! 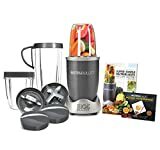 Affordable - This may be the most affordable blender you can get with great quality. With all the accessories it comes with, this is absolutely and awesome deal. Wide base cups - To make your cups more stable on the table, they designed the bottoms to a little wider. This ensures that your cups will not get easily knocked over. Compact - Takes up very little space. No need to have a big kitchen for this baby! 240-watt motor - Good for a protein shake and some smoothie. You may need to slice and dice a few of your ingredients to help your blender. A little too light - A one-hand operation is convenient. This thing may require you to use both hands to hold it steady in place. Where have you seen NutriBullet? Sounds too familiar? Yep, you’ve seen it already. You have watched it on TV! It’s one of the products featured on shopping channels! 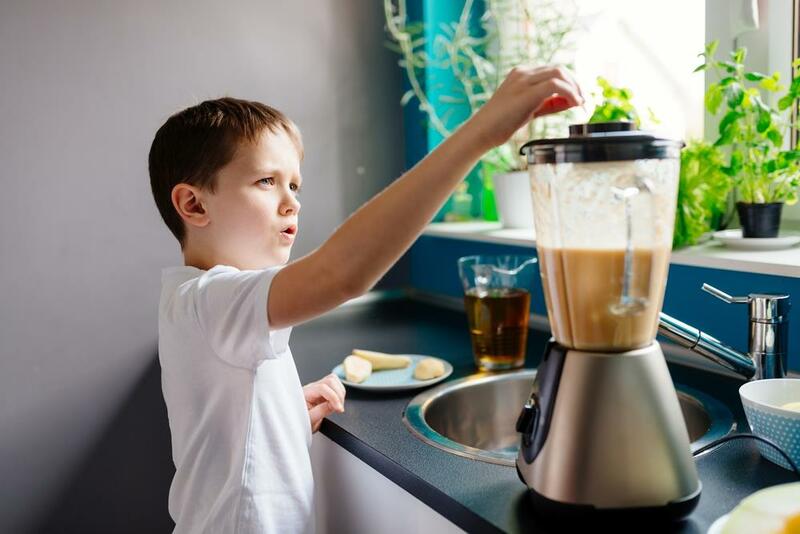 This blender has different other variants meant for baby food, soups, smoothies, juice and other stuff! The dark gray base over stainless steel gives it a professional look. And what do you know? It’s packed with a 600-watt motor and comes with 12pieces of accessories. The cups are made of polycarbonate and promise a superb durability. It comes with up to 4year of warranty too! So you don’t have to worry about paying for repairs brought about by defects. 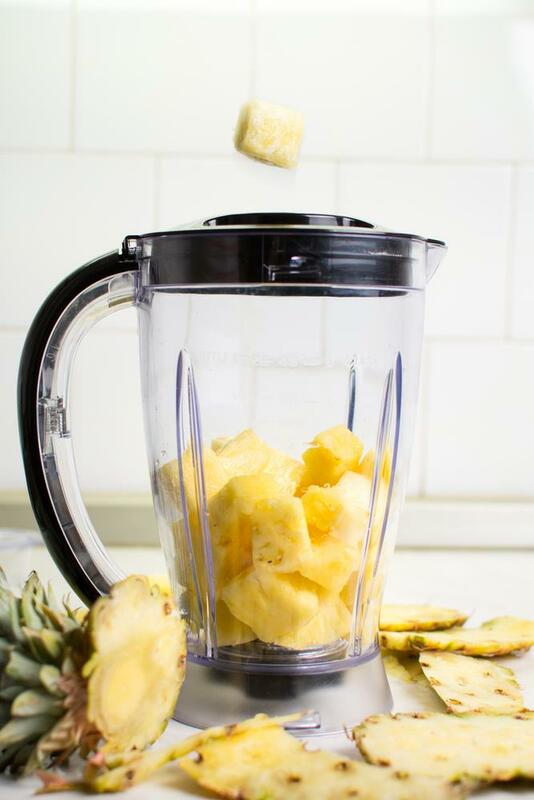 Solid, compact, and durable - This blender is built with quality materials. It feels beefy and won’t move when blending. Easy operation - Pushing the cup down will start the pulse. Rotating it clockwise while pressing down engages the lock. 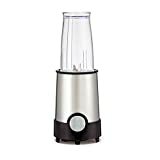 600-watt motor - This blender is equipped with a 600-watt motor that can make smoothies and shakes in seconds. It will have no difficulty crushing solid ingredients like coffee beans and other dry stuff. And guess what, it’s not noisy for a 600-watt motor! Purchasable replacement parts - In case you want more cups, you can easily purchase them separately! Expensive - It does come with a hefty price for a personal blender. But you get amazing product and warranty with what you pay for. Hamilton Beach is a century old company and has thrived through the ups and difficulties of the economy. Now, they are still here and able to deliver quality products to their consumer. This personal single serve blender comes in different colors too. It’s insanely affordable but has a few hiccups and limited functionality. But hey, if you just want a smooth protein shake, this will do a great job! Insanely affordable - Yup, this blender won’t even scratch your pocket. Compact - In a cluttered kitchen, you still won’t have a problem giving this baby a spot! Cable organizer - When you're done using this, you can easily wrap the cord around the base. Top access - You can have a taste of your smoothie and add a few more ingredients on the top access part. 175-watt motor - Not much power, but enough for shakes and some smoothies. Small jug - You are limited to a 14oz blender that doubles as a to-go canister. If you are making huge batches, this may not be for you. There you go! These are the five best blenders for protein shakes and smoothies you may want to consider. All of them are worth mentioning as they serve a great purpose. But if you want the best, Nutribullet easily beats them all regarding wattage and availability of replacement parts. The only thing is, it’s the most expensive among the five. Cuisinart is a great choice too! But, still, the Nutribullet has double the power. But you get almost the same accessories! However, if you are on a bit of a tight budget, or you don’t need all the other functions, Hamilton Beach and Bella will serve you well! I hope this review pointed you to the right direction! Feel free to ask questions and leave comments below if you have some suggestions! I will get back to you soon!